You can never ignore the sound of the organ whenever the nave brims with music. Full-bodied, grand and strong, its music reminds us of how small we are amidst all of Creation. The present organ is referred to as a nave organ. The organist plays on the console located at the chancel, near the Nativity Chapel, from where the choir sings. When played, the music is projected from pipes and speakers located in the West gallery, just above the main entrance to the nave. Their position allows the sound to travel down and through the nave during worship. The organ that we hear now is a Rodgers Trillium Masterpiece Model 1058 combination organ. It has an electronic 4-manual console and a pipe module with 6 stops. Combination organs are sometimes referred to as hybrid organs because of the digital sound-producing technology used as a primary sound source augmented by wind-blown pipe ranks. For many of us who sit in the pews facing the beautiful stained glass at the apse, we seldom pay attention to the glistening silver pipes behind us in the West gallery of the bell tower (see Photo 1). These musical pipes and the organ are part of the history of St Andrew’s Cathedral. Since 2017, organ pipes that date back to 1860 have been in the process of being restored to conserve the musical heritage of the Cathedral and reinstate the glory of organ music for worship. The majestic and powerful music from organs has long been a staple of churches since medieval days. Sound from a pipe organ is made by passing air through a narrow gap (the ‘flue’) on to a knife edge which causes the air flow to produce harmonic sound. Mozart, who was said to have referred to the organ as the King of Instruments, had numerous compositions that maximised the depth and range of the organ. St Andrew’s Cathedral was one of the first churches to have a pipe organ. Although this is not the only pipe organ in Singapore, it has a history that is dear to all who worship here. The silver pipes that you see in the West gallery were installed in March 2009, in front of the 1959 Walker pipes, now partially hidden from view. 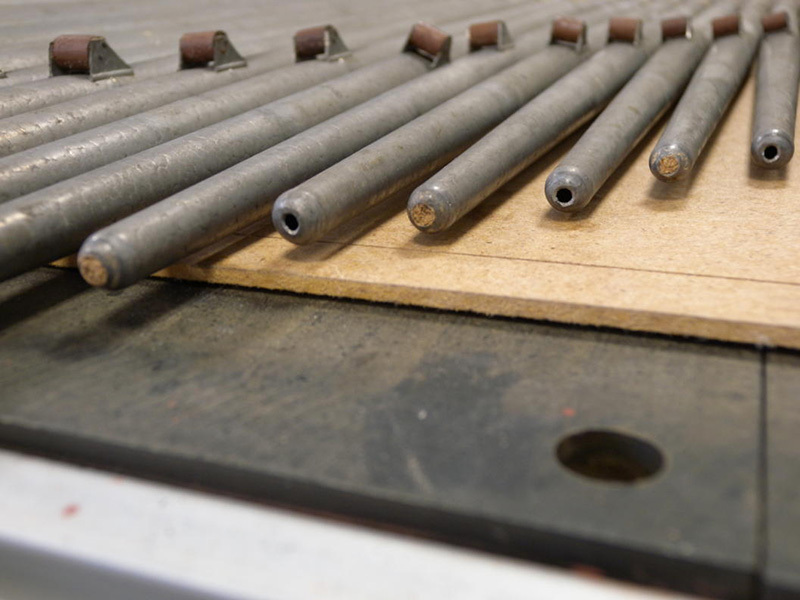 The 2009 organ casing contains 459 pipes of which 415 were repaired pipes from the 1959 Walker organ. The newer pipes are silver while the older pipes are a deep brown hue, or grey (see Photo 2). The disused pipes from the 1959 Walker organ remain intact although they are no longer working (see Photo 3). While magnificent and commanding, the pipe organ is a geographically limited instrument. Compared to other types of organs, pipe organs are generally the most expensive to purchase and maintain. And you need space to locate the pipes. The West gallery was added as part of the bell tower after the Cathedral building had been constructed. The bell tower is divided into an organ loft which is just above the West entrance and a bell loft, directly above the organ loft but hidden from view. The organ loft is a tight and confined area where the organ pipes share the space with the bell ropes for bell ringers. There is also a web of old wiring, non-working bellows, dilapidated organ keyboards, damaged pipes that cannot be reused or displayed, messy scaffolding and precarious-looking ladders from the previous organ installations. These will remain in their current state of disrepair until the area where they are currently located is tidied up for the installation of 16’ Open Wood pipes that are currently being restored in the United Kingdom. This is a challenging space to fit the pipes and casing while allowing easy access to the bell ropes, which means that the pipe casing had to be fitted just beneath the tower arch in order for the space to remain accessible. Previous organ designs required the console to be located close to the pipes because the mechanism that controls which pipes speak has a limited length. This made leading the congregation and accompanying the choir challenging, especially within the design of the Cathedral. When the organ was first installed in the 19th century, it was placed towards the front of the cathedral with the choir singing in the West gallery. The organ was subsequently moved to the gallery to be close to the choir. Later, when the choir was moved from the West gallery to the front of the cathedral, a second small organ was installed near the choir. However, circa 1888, this small organ was sold and the main organ was shifted from the gallery to the front of the cathedral to be with the choir. Around 1959, the organ and its accompanying chambers were moved back to the West gallery. In the 1970s, the pipe organ fell into disuse and electronic organs were preferred. 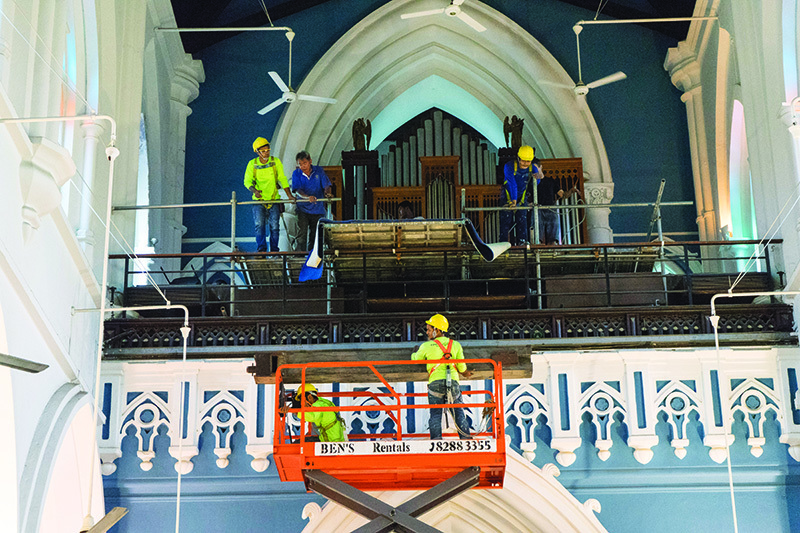 It was in 2008 that the idea of restoring the pipe organ was mooted. The Cathedral’s music ministry is one of the core foundations of the church. It echoes the same thinking inscribed in one of the old Walker pipes that is being restored – “Where shall we be in one hundred years from now?” The Cathedral’s music and ministry are part of the larger purpose of pursuing the heart of God. A hundred years from now, with the restored pipes and new choir organ, it is hoped that the Cathedral’s music and heritage will continue to inspire and lead more people to God. With a generous donation from a church member, the Cathedral has formed a committee to look into the modification of the Cathedral’s organ. Finding new purpose for the older and unused organ pipes and making them speak was an important part of this organ project. In 2016, Modular Pipe Organ Systems Ltd (MPOS), a company from the United Kingdom which designs, manufactures, and installs combination organs, conducted an audit of the organ in the Cathedral. The company assessed the state of the instrument from two perspectives: the musical needs of the cathedral and the historical value of the organ parts, especially pipes that are more than 150 years old. MPOS found that most of the organ parts were in poor condition and recommended that some of the old pipes be restored and combined into a new choir organ to be installed in the chancel. MPOS had worked on projects with many churches in the United Kingdom, China, Hong Kong, Malaysia, Indonesia, and Singapore. 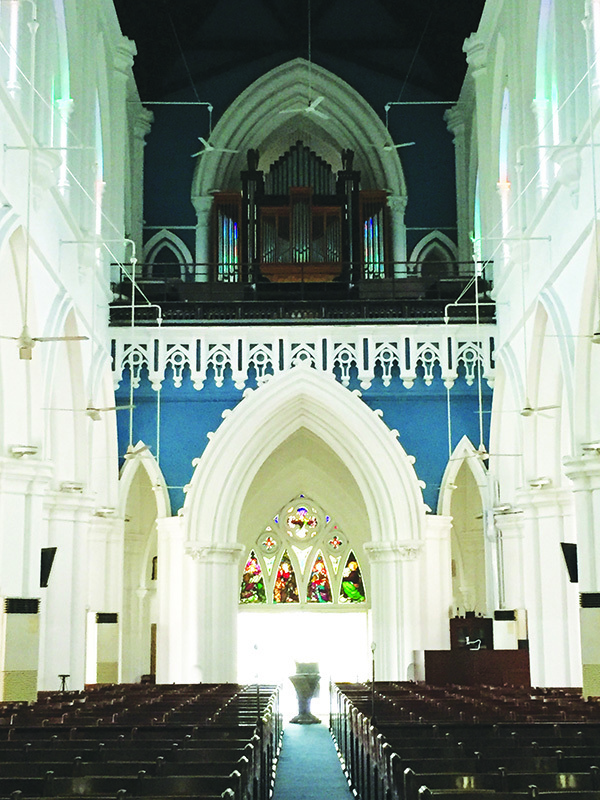 In October 2017, one of its founding directors and organ builders, Paul Mortier, spent two weeks in Singapore to catalogue and assess the pipes in the cathedral in terms of their historical value, their functionality and their ability to make good musical contribution to the organ. 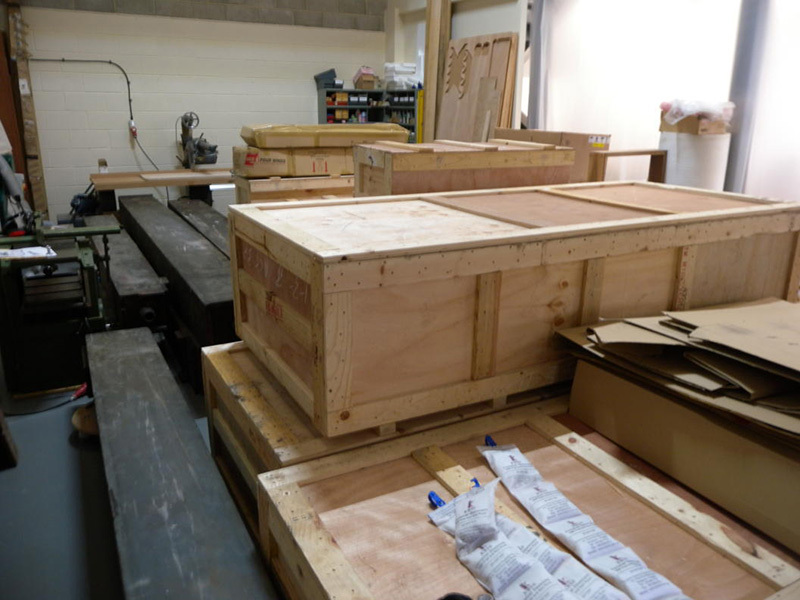 Eventually, some 600 unused pipes from the Walker organ were packed and shipped to the United Kingdom for repair and restoration. The largest pipe weighed around 150kg and was roughly 6m long. These 600 pipes will be be combined with new pipes to form the new choir organ. In the United Kingdom, the pipes will be first cleaned and assessed, followed by work on the voicing of each pipe; that is, checking and regulating how well each pipe speaks. After the pipes are restored, the current nave organ console that is located in the chancel will be reconfigured. The existing Choir division1, currently speaking from speakers on the gallery, would instead speak from the chancel speakers and pipes. This would effectively move the current Choir division from the gallery to the chancel. To accompany the choir, one manual of the current console will activate pipes to speak from the chancel. When the console is played as a nave organ to lead the congregation, the pipes will speak from the West gallery. This will enable music from pipes to be played from the same console without complications, and at the same time, recapture the fortissimo of the instrument. The new chancel organ will be located in the space above the South vestry, just opposite of the location where the current organ console now sits (see Photo 4). 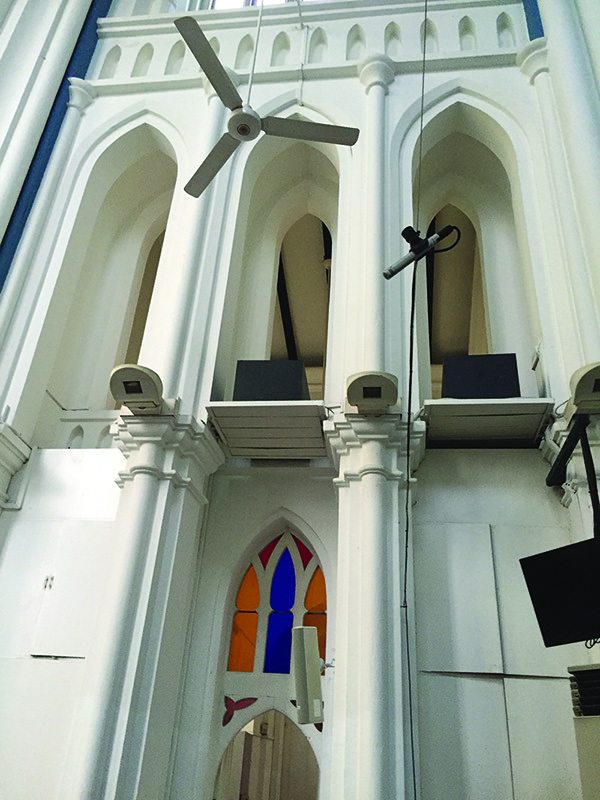 MPOS recommended this location because it would allow the chancel organ to produce good musical effect while providing access for installation and maintenance. The organ cases will be made largely from oak to match the organ case in the West gallery. The casing design is based on the St Andrew’s cross. Pipe mouths and lengths will be adjusted to meet the required shapes. Three organ cases will be fitted within the three narrow openings above the South vestry, with some 600 pipes installed behind the cases. The larger pipes that will be installed in the left and right openings will consist of new pipes made of seventy per cent tin, to match the pipes that we see now in the West gallery. The pipes for the middle bay will comprise dark grey pipes from the old organ. This is a deliberate design to show the link between the new and old organs so that together, they tell the story of the Cathedral’s past and present. The electric blower, wind pressure regulator, pipe chests, amplifiers, speakers will be placed behind the casing. The back of these cases will be left open so that the sound will float into the chancel unobstructed. Other restored pipes such as the 16’ Open Wood pipes will be placed in the West gallery on either side of the existing organ casing so that they form a wooden frame and a link between the old and the new. When installed, this will be a magnificent structure that shows off the height of the cathedral. These pipes will also have an independent wind system. 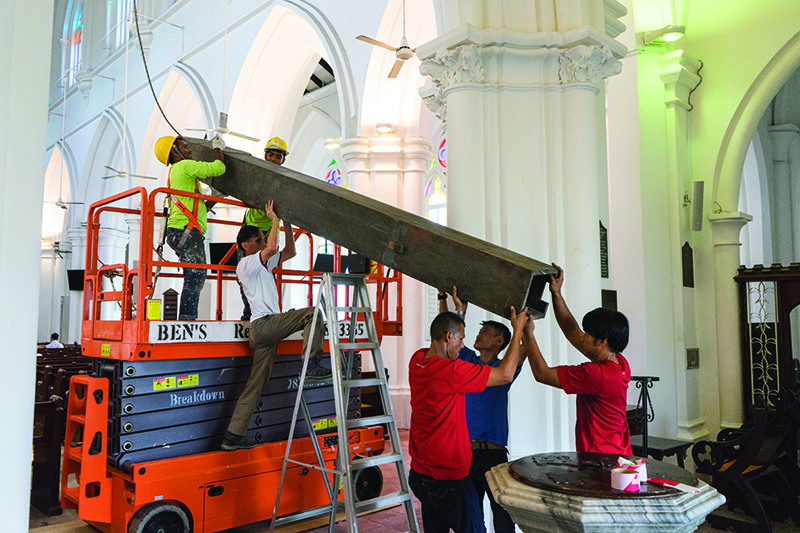 The restoration of the organ pipes and installation of a new chancel organ is a complex project but it is a historically significant milestone in the Cathedral’s history. If everything goes as planned, new and old pipes will speak from the nave by Christmas this year to bring 2018 to a close, and herald in a year of harvest in 2019. 3-stop barrel organ with around 120 pipes was installed. The Holdich 1 manual+pedal organ was purchased at £260. Church building was deemed unsafe and the Holdich organ was moved to a parishioner’s house. 1861 John Walker 2 manual+pedal organ was purchased and installed between 2 pillars by the North porch for £600. After the Walker organ was moved from the North porch to the West gallery, a small (1 manual+pedal) Bryceson Brothers organ was purchased and installed at the chancel. Hill, Norman & Beard 3 manual+pedal was purchased and installed. It included parts (including the pipes) of the 1861 Walker organ. A Rodgers electronic organ was donated to the church. An Allen electronic organ replaced the Rodgers organ. The Allen organ is now in the Cathedral New Sanctuary. A Rodgers Trillium Masterpiece Model 1058 electronic (4 manual+pedal) organ was purchased and installed. 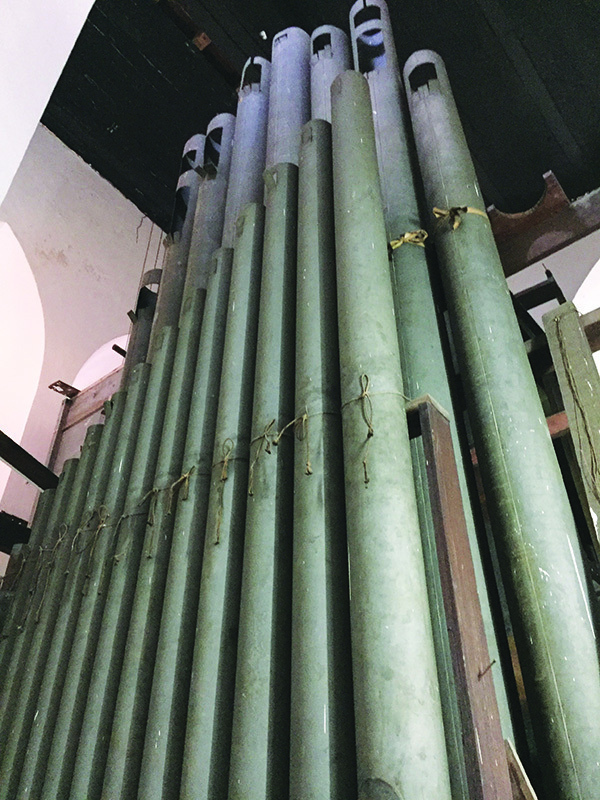 415 of the 459 pipes from the 1959 disused Walker organ were sent to the United Kingdom for repairs. A pipe module with 6 stops was installed in the West gallery, in front of the 1959 Walker organ. 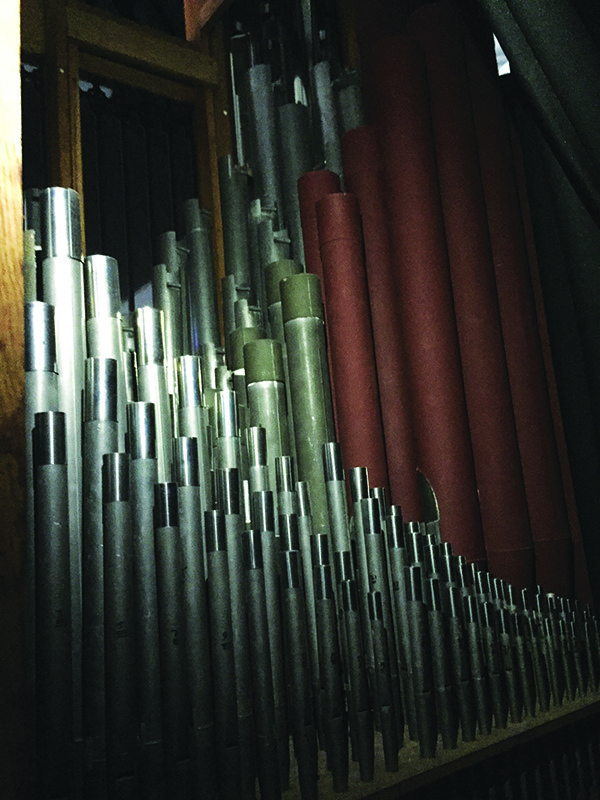 The 415 restored pipes from the Walker organ were fitted into a new organ case and combined with some 50 new pipes. These were connected to the Rodgers console to form a combination organ. Restoration of 600 pipes began and a new chancel organ is designed.